Eye of the Temple is a VR game that lets you explore a vast and treacherous temple using your own feet. Keep your balance as you step from one moving block to another, dodging traps and solving puzzles with your torch and whip in hand. Eye of the Temple makes unique use of room-scale VR and delivers the experience of exploring a vast environment. Lose yourself in the depths of the temple without teleportation, artificial locomotion, or other distractions taking you out of the immersion. After positive reception of the 2016 VR game jam game Chrysalis Pyramid, Rune Skovbo Johansen decided to create a more ambitious spiritual successor. Keeping only the core mechanic of stepping from one moving block to another, development of Eye of the Temple began in the spring of 2016. A whole different aesthetic and environment was chosen for Eye of the Temple, focusing on the atmosphere of treacherous temples from classic action adventure films. After much research and development, a physically simulated whip was added as a new core mechanic in 2017. Unique ability to traverse a vast environment using your own feet. A fully physically simulated whip for puzzle and action use. Immersive action dodging treacherous traps with your own body at perilous heights. An experience with no buttons required that anyone can immediately grasp. Sanctum Dreams allows for the contents of Eye of the Temple to be published through video broadcasting services for any commercial or non-commercial purposes. Monetization of videos created containing assets from Eye of the Temple is legally & explicitly allowed by Sanctum Dreams. This permission can be found in writing at http://eyeofthetemple.com/press/sheet.php?p=eye_of_the_temple. 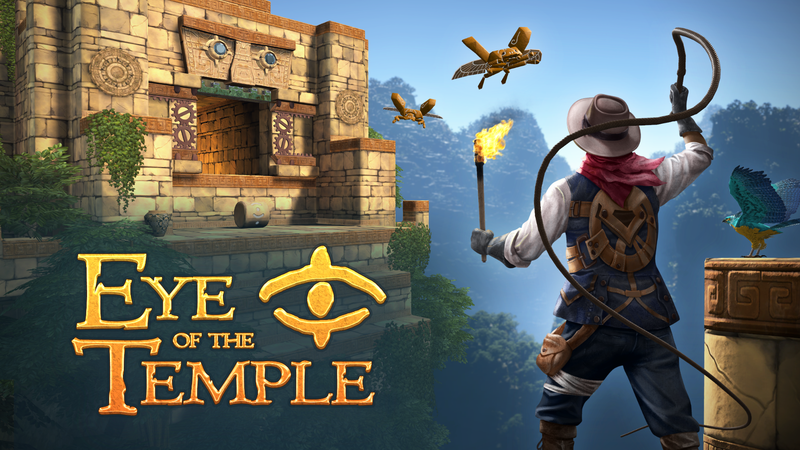 Visit Eye of the Temple on Steam: store.steampowered.com. Sanctum Dreams is the game studio of independent game developer Rune Skovbo Johansen, based in Copenhagen. His work spans games and other interactive experiences, focused on tech, wonder and exploration. More information on Sanctum Dreams, our logo & relevant media are available here.